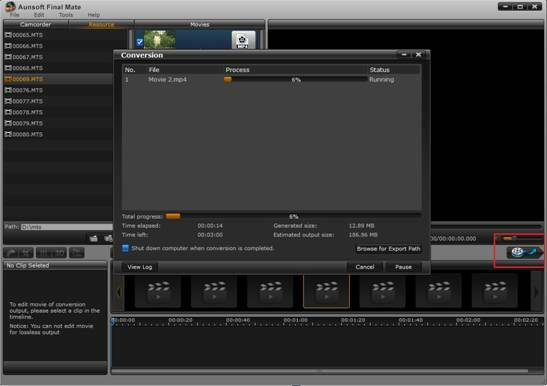 For all the HD camcorder fans, AVCHD MTS file must be familiar with. And they would know that an AVCHD footage will have its own video stream and audio stream. But maybe not all of the HD Camcorder fans would know that it is also composed with another steam additionally, a PGS Subtitle stream. In this stream, it will record the time and date of the shooting. So it is also called as PGS Timecode or Timestamp. We would like to memorize the important footages shot in some special date, such as the wedding ceremony or some important situations. So if the shooting videos will displayed the timecode all the time, it would be nice. 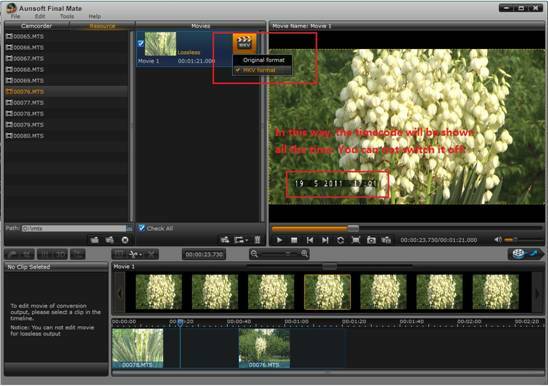 But only few MTS players, MTS converters and AVCHD editors are able to read the timecode integrated in the MTS files and get the timecode from AVCHD file displayed and converted. In the VLC Player, you can display the timecode in the playback by opening it in the right-click menu, video option and switching the option for subtitle track on there. But in any professional editor programs, such as Sony Vegas Pro, Adobe Premiere and Final Cut Pro, this subtitle track can not be captured. So it would be annoying if you want to judge the order of the video clips by the time and date when they are shot. For example, after coming back from a wedding ceremony, you got several hundred clips from 3 different HD Camcorders, how do you know their shooting orders if your editor programs can not read and show timecode from AVCHD files? Aunsoft Final Mate, (Windows and Mac version are all available), will help you to view the timecode and timestamp both in the original and output files. Following the steps below, you will get to know how to get the timecode displayed after the MTS Conversion. 1. Load the MTS file into the Source list of the program. Your MTS file can be loaded from your camcorder directly by Camcorder Wizard or from your local folder. Tips: Aunsoft Final Mate support the file loading of AVCHD MTS files, M2TS files (not from Blu-ray), MOD and TOD files. 2. Create a conversion movie by dragging the files into the Movie list of the program directly. 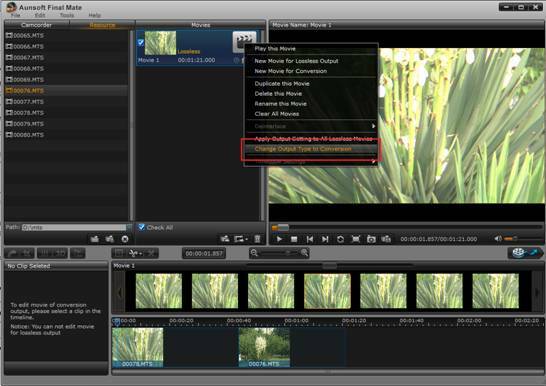 The type of the movie can be switched from lossless to conversion by the option in the right-click menu. Tips: The conversion movie can be also created by the option in the File Menu or the shortcut key Ctrl + Shift + O, Command + Shift + O on iMac version. 3. In the conversion movie output setting, the timecode display will be switched on or off by the right-click menu options, as well. For all the conversion profiles we offered in the program, you can select to show the timecode or not as you need. Tips: And if you want to get a lossless movie and show the timecode in the lossless output, you must select MKV format in the lossless movie type list. But in the MKV lossless output, you can not select to switch the timecode showing on or off and it must be displayed all the time. 4. 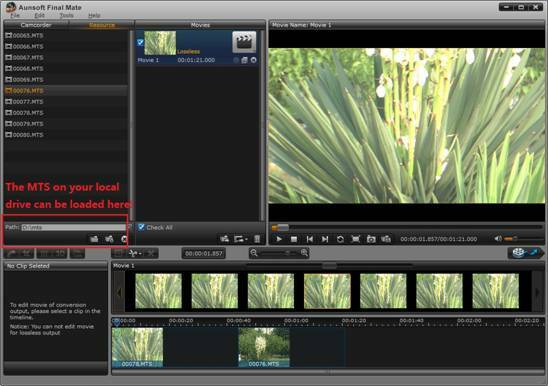 Of course you can edit the MTS movies, such as merge, split, cut and trim on Time-line and Frame by Frame edit. After that, you can start the MTS Conversion by clicking "Export". What to do next? 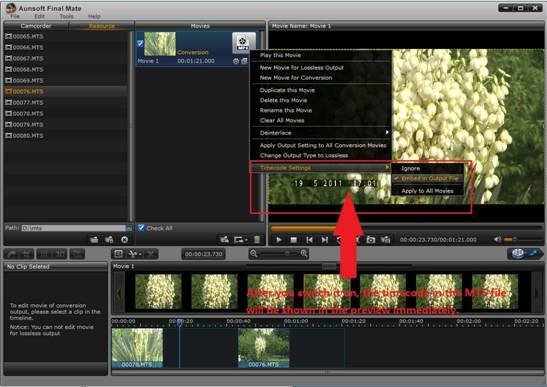 You can import the output files into the professional Editor programs, such as Adobe Premiere, Sony Vegas and Final Cut Pro X (Prores 422 profile is available by Mac version only) and edit the video clips with timecode display and you can view the timecode in editing your video clips all the time. Aunsoft Final Mate can convert MTS files to all of those supported formats.